HUMMUS | YUM YUM PIGGY'S BUM...! 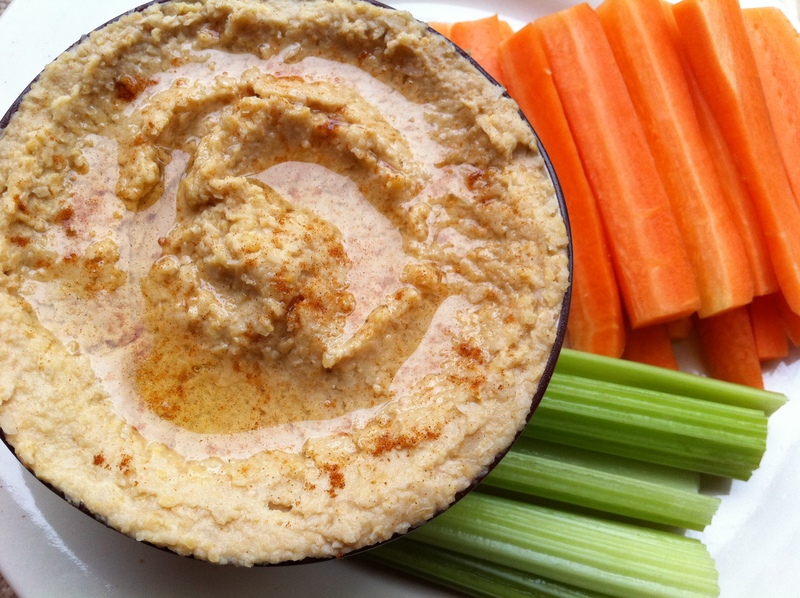 Hummus, houmous, humus and hommos are different spellings of this Middle Eastern dip made from chickpeas, olive oil, lemon juice, tahini (sesame seed paste), garlic and salt. It’s easy to make if you have a food processor to puree the chickpeas and tinned ones are more convenient than dried ones as they require soaking and cooking for a while. You can eat flatbreads, toasted pitta bread or vegetables cut into lengths for easy dipping into the hummus making this quite a tasty snack when you’re at home or work. Be warned, raw garlic is used so be aware that you might breathe garlic fumes into your colleagues’ faces when speaking to them or perhaps your girlfriend’s/boyfriend’s nostrils. They probably won’t be appreciative of your tasty snack. I advise chewing on parsley or chewing gum otherwise you might be rejected romantic snogs from your partner or your colleague may be stepping back from you gradually. Drain the liquid from the tin of chickpeas and rinse chickpeas several times with cold water. Blend chickpeas, lemon juice, 1 clove of garlic, tahini, olive oil, cayenne pepper and salt in a food processor until the consistency is smooth. Taste the mixture and adjust seasoning if needed such as adding more lemon, garlic and salt. Blend again if required. Spoon mixture into a bowl and smooth the top of it flat and then use a small spoon to make a circular indent. Sprinkle cayenne pepper on top if you want. Pour a small amount of olive oil into the indent. Serve with your favourite toasted bread and/or vegetables cut into lengths.